Easter Sunday at our house is like a mini Christmas with all the family, old and young, not to mention the excitement of the Easter Egg Hunt in the front garden. This year not wanting to go for the full blown sit down Sunday lunch we opted for cold roast chicken, hot jacket potatoes and coleslaw buffet lunch, find a seat or stand up, casual affair for about 25! 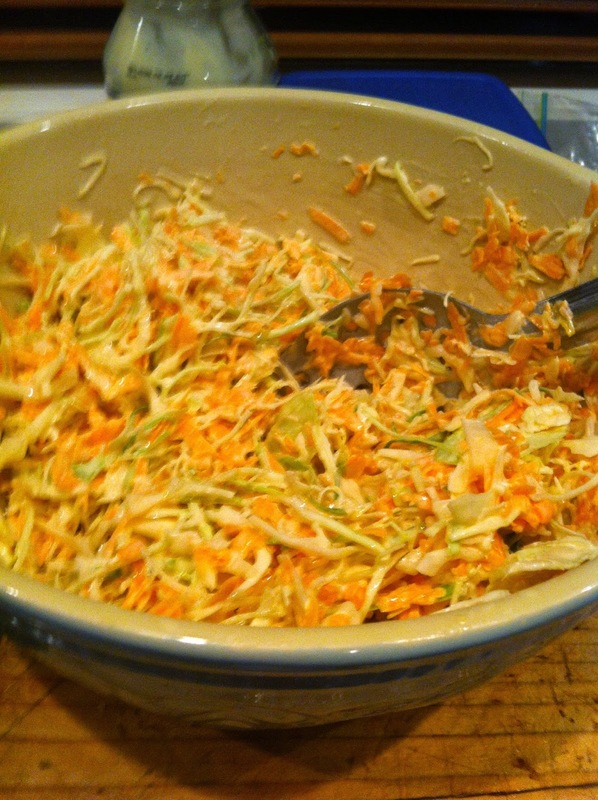 I began the coleslaw the night before, using my new "Slicer Dicer", and sliced finely a whole cabbage, grated 6 large carrots and a couple of sticks of celery. Sunday I started to mix in the whole egg (shop bought) mayonnaise as people started to arrive. No. 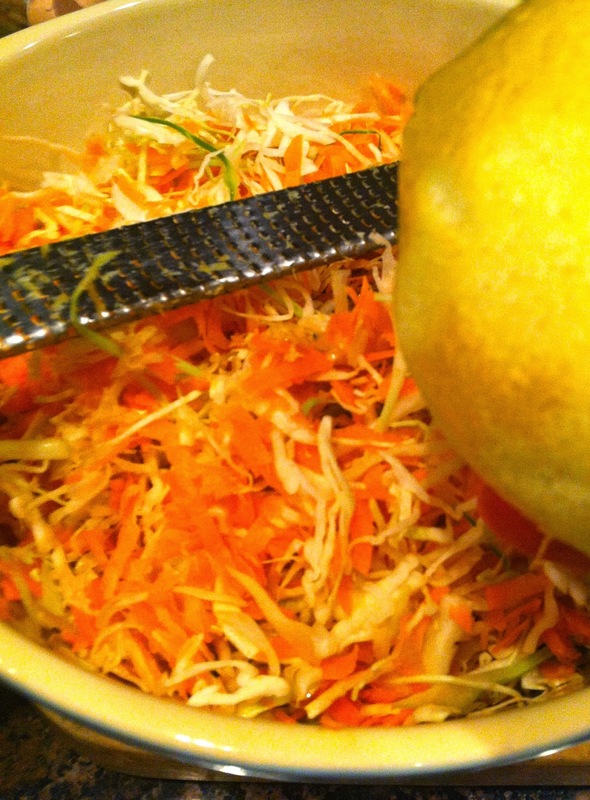 2 son took over the coleslaw and added a couple of his own ingredients - the zest and juice of 1 very large lemon, together with a heavy handed glug of extra virgin olive oil, salt to taste and a strong arm to mix thoroughly. A fresh grind of pepper and sprigs of celery leaves to dress for the table. 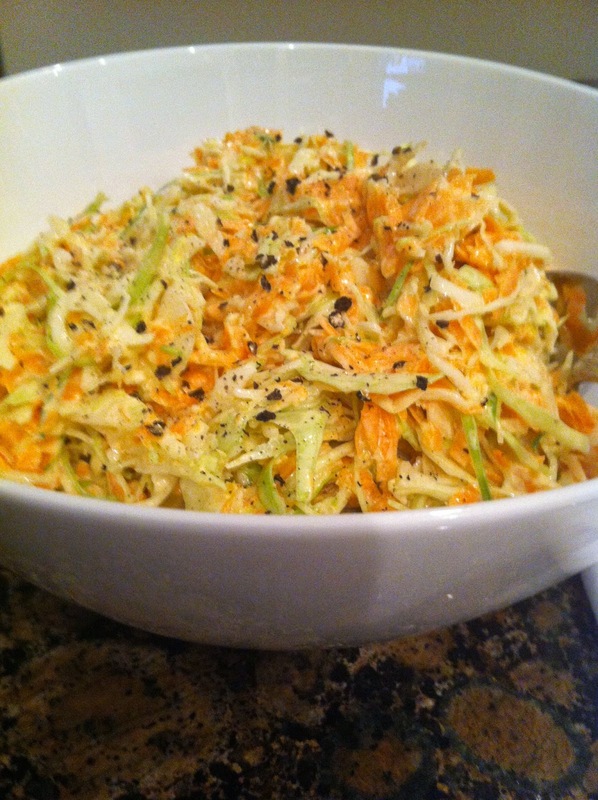 Everyone said how much they loved my coleslaw! Black ground pepper and celery leaves to dress. What to do. . . .
Add mayo and enough olive oil to loosen the vegetables. 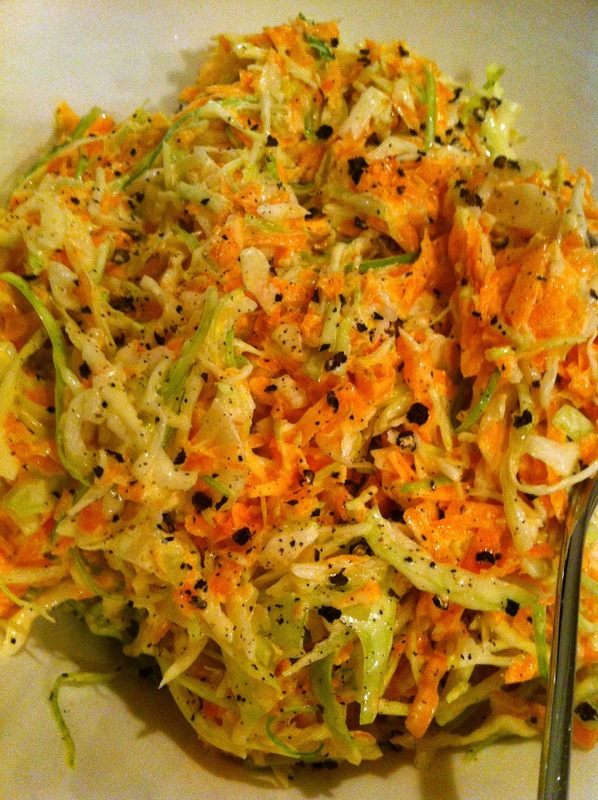 Grind pepper on top and dress with celery leaves. Oh yum - must try this. As this fed a crowd you will obviously want to reduce the quantities somewhat, but it was so yummy I couldn't stop eating it. It sounds like an awesome Easter gathering. I think that the best times are family orientated. We would like to add your blog to the Top Food Blog list in mytaste.com . Your blog is impressively BEAUTIFUL and it deserves to be included on the Top list!! Great recipes!! We will feature your blog and we will make a lot of shout out about your recipes on our fan pages so that people and our 3million users worldwide will be able to check it on our site. Mytaste is a dual-function site, a recipe search engine and an online social networking service providing thousands of recipes collected and shared by people around the globe from different blogs and website. Some of the top food blogs receive at least 30,000 visits from us on a weekly basis. 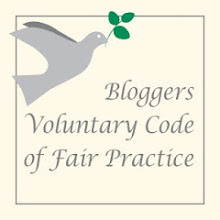 This is something you can do to make your blog more visible and be exposed to a lot of foodies in United States and Canada and around the globe, this can help your blog page to get more visits/increase traffic. Please be kind enough to reply to this message so we should know you have received it.